So it comes as no surprise that Bulls coach Tom Thibodeau said his team will be making several following a 102-93 Game 1 loss in which Chicago relinquished a double digit lead in the second half. Mike Dunleavy and the Bulls take aim at evening their first round series with Washington on Tuesday night at 8:30 p.m.
During the regular season, Chicago was 41-5 overall (23-3 at home, 18-2 on the road) when leading its opponent entering the final quarter. 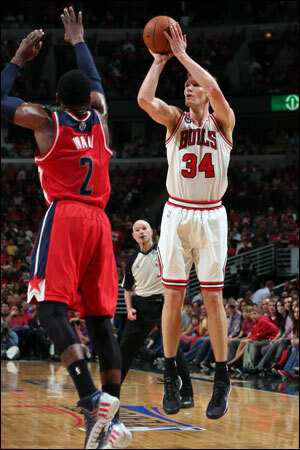 The Bulls took a 75-72 advantage into the fourth only to see the Wizards overcome it and hold on for the victory. That was certainly one of a few things on Thibodeau’s mind as he readies his team for Tuesday’s Game 2. Thibodeau pointed to team defense as one major area of emphasis as Chicago tries to even the series at 1-1. Bulls forward Mike Dunleavy acknowledged that the team was disappointed in its effort on Sunday. Though Washington’s backcourt of John Wall and Bradley Beal shot a combined 7-25 from the field in the opener, the Wizards still managed to connect on 48.6 percent of their attempts. Thibodeau credited the Wizards for the way they kept grinding, challenged shots and rebounded the ball. He said that Chicago recorded only 13 assists was a concern, but that part of it is doing a better job converting offensively. So, yes, adjustments must and will be made. But in the Bulls’ case, perhaps most of those adjustments can be simply doing what they’ve done so well all year for, as Thibodeau likes to say, 48 minutes. And that starts with the intangibles. Intensity was a word that more than one Bulls player used following the Game 1 defeat. It’s an element the Bulls seemed to rarely lack throughout the regular season. As their first round series continues, it will be vital to get it back and keep it in place.